Six Months After Drawing, Couple Steps Forward to Claim Share of Record $1.6 Billion Powerball Jackpot since three winning tickets were drawn on January 13 drawing. Two of the ticket holders came forward quickly, but the third ticket holder remained a mystery until Tuesday. Marvin and Mae Acosta were among three big winners of $528.8 million from a January drawing, the largest prize in California Lottery history. The other winning tickets were sold in Tennessee and Florida and the total jackpot was worth about $1.6 billion, officials said. The Acostas bought their winning ticket at a 7-Eleven convenience store at 4092 Chino Hills Parkway, Calif. They have opted to take the cash option of $327.8 million before federal taxes. officials said, The 7-Eleven also received a maximum bonus of $1 million for selling the winning ticket. The Tennessee winners were a small-town couple, John and Lisa Robinson of Munford, who also took the lump sum payment. Meanwhile, The Florida winners, David Kaltschmidt and Maureen Smith of Melbourne Beach, took the lump sum as well. The Powerball winning numbers for Wednesday, January 13, 2016 are 4,8,19,27,34 and Power Ball number is 10. 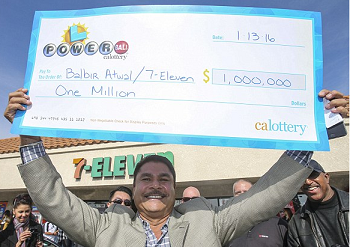 Balbir Atwal, owner of the California 7-Eleven store received a maximum bonus of $1 million for selling the winning ticket.